With the promise of warmer weather has Daryl thinking of all the rock that needs to be picked out in the fields. Yup, unfortunately this is one of the things that happens every spring in our area of Iowa. Now I heard that there are farms that don’t have rock and I’m thinking that this sounds almost unbelievable doesn’t it? I mean how can some farmers be so ‘blessed’ (?) with so many rocks and others not? Oh well, we’re the ones that seemed to be in the blessed category so that’s just how it is! Now if you’ve never picked rock or haven’t picked rock for sometime, you know that you need a good rock wagon to join you on this adventure. So after Daryl took a look at the one that we’re going to use, he thought it’d be a good idea to replace one or two of the boards. 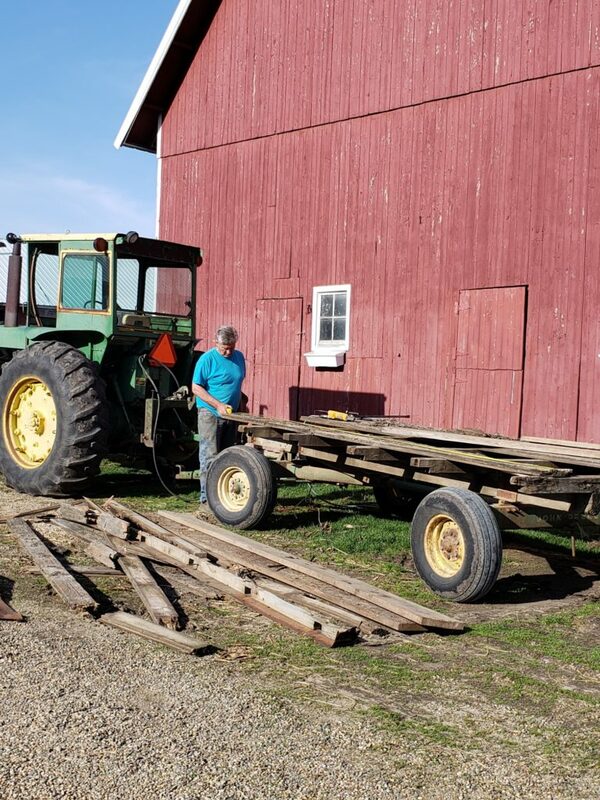 But one or two of the boards turned into replacing the whole top of the wagon. There seemed to be more bad boards than he originally thought at first. I think you need birth control for your rocks.